Taste test: There are a lot of chips in this bag. 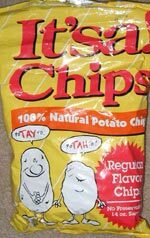 They taste like Lay's but less salty. Not bad. They sort of shatter into a lot of pieces when you bite into them and leave some residue on your hands. Smell test: These smell wrong, like paint.